My grandmother and most of her siblings emigrated to Australia early in the 20th century, after the death of her father. One brother remained behind however. His name was Thomas Sim McCorkindale (the Sim being his mother’s maiden name). 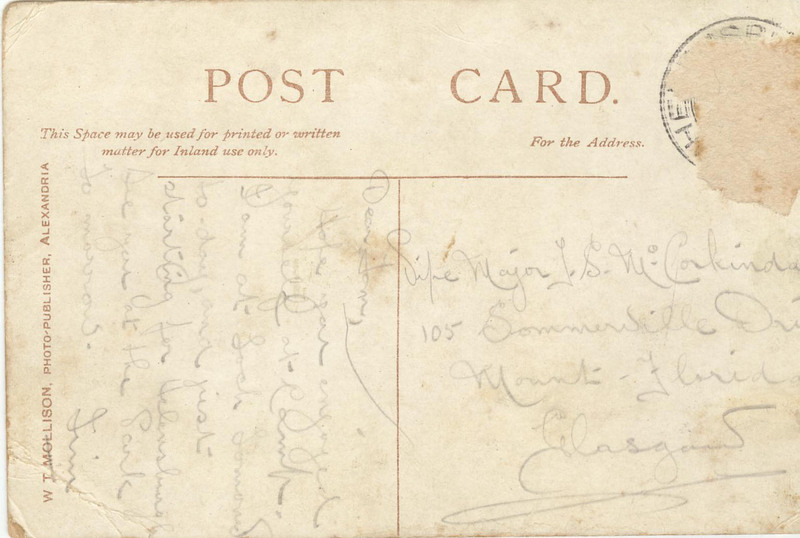 Thomas Sim McCorkindale married Jane Wilson McVey in Glasgow in 1910 and they then moved to London where Thomas had been working for a while as a carpenter/cabinet maker. They had two children that I have identified: Elizabeth Y L McCorkindale born in 1911 and registered in the December quarter in the Barnet district. Their son, another Thomas Sim McCorkindale was born some years later in 1916 and registered in the Marylebone district. I can find no other likely children in the BDM searches. Thomas served in WWI with the London Regiment. His discharge papers indicate he did not serve overseas and was discharged due to ill health. 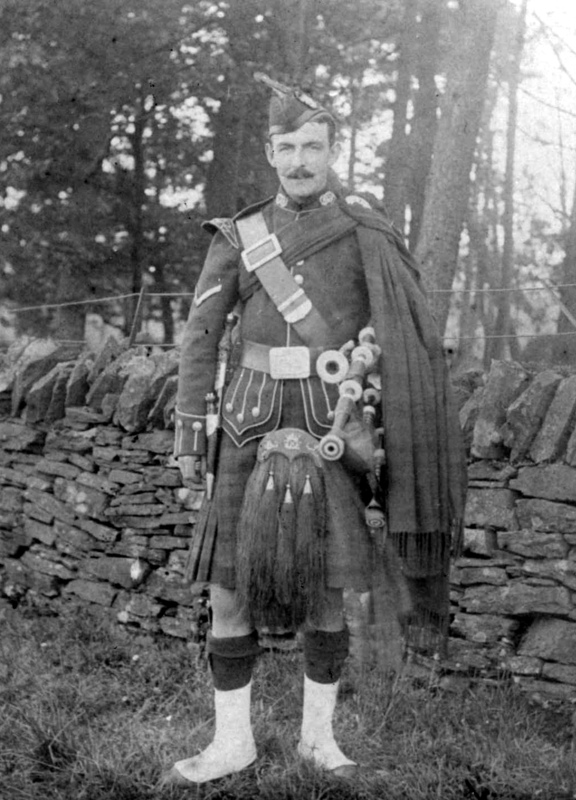 Family story is that he was Kitchener’s piper and was badly hurt and sent home “in cotton wool”. This is most likely rumour but on the other hand he was a A/Piper with the London Regiment and his brothers were all champion pipers in Australia on migration. I have been trying to find Thomas senior for some years and recently bought death certificates for him and his son. Thomas Sim McCorkindale senior died, aged 78, on 24 December 1961 at the Memorial Hospital, Finchley. He was a retired carpenter and joiner, formerly of 13 Nether St, Finchley. (This appears to be the Dr French Memorial Home). His son was the informant and at the time Thomas jnr was living at 14 Norman Court, Hatfield Rd, Potters Bar. I have not yet found the death of Jane McCorkindale nee McVey. Thomas Sim McCorkindale married Vera Doris Fox in 1942 and the marriage registered in the December quarter 1942 in the Barnet district. Vera’s death in 2001 was registered in Worthing. I have not managed to identify whether the couple had any children. Thomas Sim McCorkindale jnr died at the Princess Royal Hospital, Haywards Heath on 18 March, 2003. He was also a retired cabinet maker. He had been living at the Upper Mead retirement home, Fabians Lane, Henfield, West Sussex. He had been born on 22 December 1916 at St Marylebone, Westminster. The informant was not a relation. Elizabeth Y L McCorkindale married Leonard F Mellor in 1936 and the marriage was registered in the Barnet district in the December quarter. Because Mellor is not an unusual name I’ve had trouble finding the births of any children or the deaths of the couple. The Question: Are there any descendants of these relations of mine still living in London (or elsewhere) or did this line die out? I’d really like to find an answer to this puzzle. Question 2: Does anyone recognise the uniform Tom is wearing in the above photo which is likely to have been taken c1900-1910. This entry was posted in Brickwall, Family History, McCorkindale Family History, Scottish Family History and tagged "fife major", "thomas sim Mccorkindale" "Jane McVey" McCorkindale, bagpipes, brickwall, Elizabeth Y L McCorkindale; Leonard Mellor; Mellor;, Henfield, Jane Wilson McVey; Vera Doris Fox; McVey; Vera Fox, uniform, Upper Mead by cassmob. Bookmark the permalink. Hi Pauline, good luck finding relations! Can’t remember if you already knew that T. S. McCorkindale was declared bankrupt in 1924? I had a look in The Times digital archive (which you probably have access to now anyway), and apart from boxing and golfing McCorkindales, found the 1924 bankruptcy list. No occupation given, strangely.